DLF share price has been falling for the last three days and lost 6.79% during the period. The stock hit an intra day low of Rs 152, down 4.85% compared to the previous close of 159.85 level on the BSE. The DLF share price is trading below its 50-day and 200-day moving average of 176.49 and 180.45. 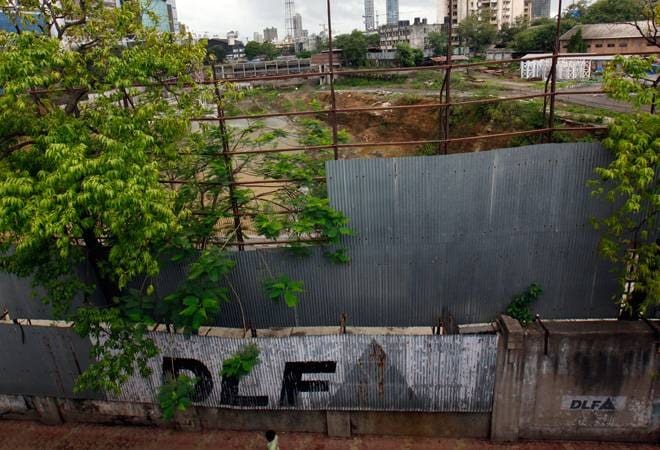 The DLF share price fell in trade today after the realty firm reported a 92 per cent decline in its consolidated net profit at Rs 335.15 crore for the third quarter of this fiscal. The large-cap stock has been losing for the last three days and lost 6.79% during the period. The stock hit an intra day low of Rs 152, down 4.85% compared to the previous close of 159.85 level on the BSE. It closed 0.13% higher at 160.05 on the BSE. The DLF stock has lost 31.44% during the last one year and has fallen 13.13% since the beginning of this year. Six of 14 brokerages rate the stock "buy" or 'outperform', four "hold", two "underperform" and two "sell", according to analysts' recommendations tracked by Reuters. The DLF stock is trading below its 50-day and 200-day moving average of 176.49 and 180.45. Net profit tanked 92% in Q3 as the firm had posted an exceptional profit in the year-ago period from stake sale in rental arm to GIC. Its net profit stood at Rs 4,091.27 crore in the year-ago period. However, total income rose to Rs 2,405.89 crore during October-December quarter of 2018-19 fiscal year from Rs 1,855.21 crore in the corresponding period of the previous year. The profit fell due to exceptional gain of Rs 8,569.34 crore during the third quarter of 2017-18 fiscal, mainly on the back of promoters stake sale in rental arm DLF Cyber City Developers. Promoters had infused funds into DLF to reduce debt. Rahul Agarwal, Director at Wealth Discovery/EZ Wealth said, "Currently, the stock is trading at a PE of around 5.77 on consolidated basis and has a Price to Book ratio of around 0.81. Post de-effecting the exceptional income in the same quarter last year, DLF appears to be on track of recovery with three consecutive good quarters. Going forward, we can see more demand coming in the realty sector as there were a lot of impetus announced in the current year budget (such as benefit of rollover of capital tax gains on residential house, no tax on notional rent on second self-occupied house, increase of the period of notional rental on unsold real-estate inventory from 1 year to 2) these positive catalysts are expected to provide an impetus to the real estate sector in general and DLF being one of the major players is expected to benefit immensely. Investors should hold the stock at this time and are advised to book profit on any sharp rise in the stock price only to buy back the stock at lower levels." Operating profit (excluding other income) fell to Rs 639.91 crore in Q3 compared to Rs 701.29 crore for the quarter ended December 2017. Earnings per share fell to Rs 1.88 in Q3 of the current fiscal compared to Rs 22.93 in the corresponding quarter of the previous year. Its profit after tax margin shrinked to 5.01% for the quarter ended December 2018 compared to 242.66% in the corresponding quarter of the previous fiscal. Meanwhile, the Sensex was trading 287 points higehr at 36,904. The Nifty breached the 11000 mark rising 95 points to 11,029 level.